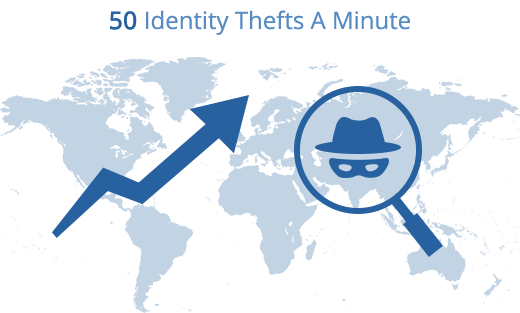 Millions of personal information like browsing history, call history, messages, photos, accounts etc. is stored in iPhone. You can delete them easily but the files stay hidden on your device only to be recovered later most probably by cybercriminals. 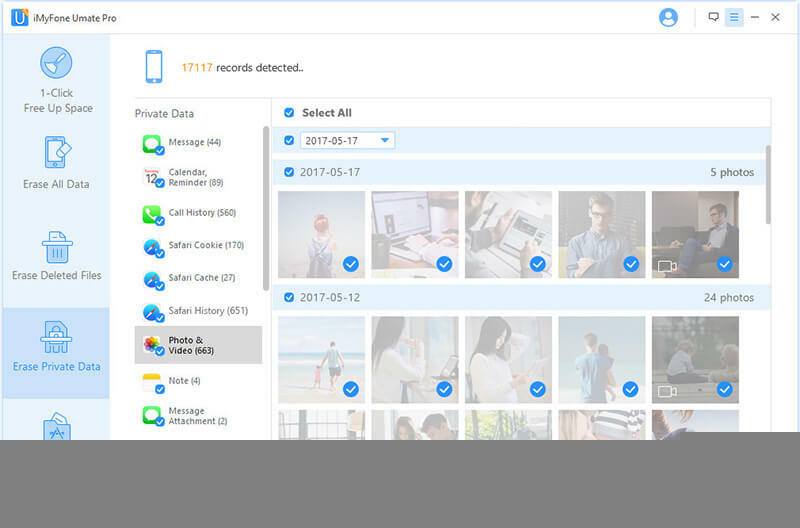 To protect you from identity theft and fraud, iMyFone Umate Pro completely erases all sensitive iOS data, no hacking tool can ever recover the data erased by iMyFone iPhone Data Eraser. You can use this iPhone Data Eraser to scan and find out all invisible junk files on your iPhone/iPad, clean them and speed up your device. It's for free. iMyFone iPhone Eraser will scan your device and show all your private information (current and previously deleted data). It's totally free. Not only existing private data, but also your manually deleted information (invisible but recoverable) on your iPhone / iPad, can be erased permanently so that no one can hack your device. With a preview before erasure, you can choose to erase all the data with one click, or you can selectively erase data that you don't want to keep. The 1-click cleanup mode allows you to clean up hidden garbage and corrupted files that are still lurking on your iPhone, making your iPhone run faster, just like when it was brand new. 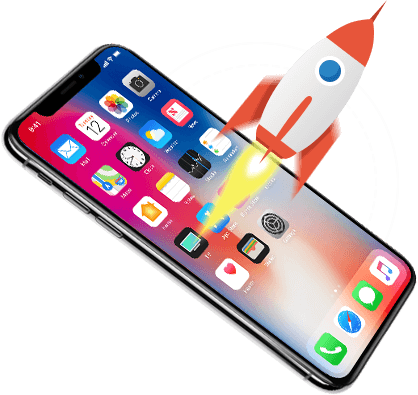 With 25+ advanced space saving analysis technologies, the iPhone Data Eraser will scan and analyze your iPhone completely and figure out how much free iOS memory space can be released. reliably like it never existed. device. We erase them all with no chance of recovery. A normal reset is recoverable. Umate Pro makes erased data irrecoverable even by the FBI! This ensures your personal chats are fully wiped and prevented from hackers. 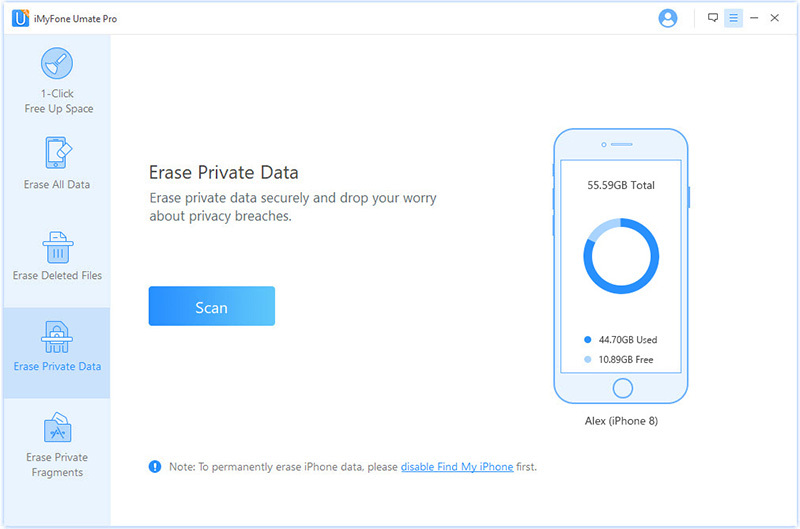 With iMyFone iPhone Data Eraser, you can scan and view your 3rd party App data and select private data to erase permanently. Note: Fragments are not cookies, cache or messages but the incomplete leftover of data that entails high privacy exposure risk. The 1-click cleanup mode allows you to clean up hidden garbage and deleted files that are still lurking on your iPhone, making your iPhone run fast, just like when it was brand new. Why should I permanently erase data? Because "simple deleting" just erases the pathway to the information and it remains recoverable if right tools are used. The file only gets marked as deleted but isn’t actually removed. 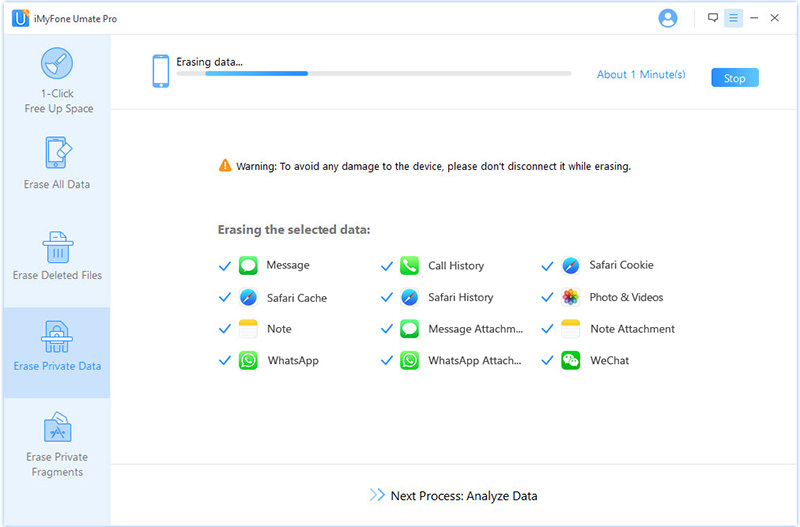 How iMyFone Umate Pro permanently erases data? Umate Pro removes the original files in your device including the ones marked as deleted. Once the process of erasure is complete, Umate Pro will store random data on your device storage to overwrite deleted files. Then it again deletes the files and refills data again until recovery becomes impossible. After such intricate removal process, even the FBI cannot recover your data from the device. What does “Erase Deleted Files” mean? Deleted files can be recovered if these aren’t overwritten. Erase Deleted Files option in Umate Pro will fully remove previously deleted files as well as overwrite them. This makes them 100% unrecoverable. Does a hard reset erase everything on iPhone? Best alternative to iPhone factory reset! How to erase iPhone data without restore? How to erase deleted messages on iPhone? How to permanently delete iPhone history? How to clear Safari history on iPhone? How to permanently delete iPhone WhatsApp Message? How to delete WeChat chat history?